Currently there are 42 wars raging throughout the world, the word nuclear continues to circulate, and now we hear the added threat of WWIII. The Prophets, the Apostles, and Yahshua Messiah all spoke of this Last Generation. Yisrayl Hawkins foretells the events, as the prophecies stated he would, in the great nuclear age – Daniyl’s prophesied age of increased knowledge. Future Priest Deacon White Buffalo spoke on the Creation of Yahweh. Reading excerpts from the Second Book of Yisrayl, children’s edition, and Genesis 1:26, he reminds us that Yahweh knew what character we would have and that there will always be different personalities. Detailing characteristics of the eagle and its amazing eyesight, the deacon draws our attention to the fact that Yahweh’s Creation is perfect. Future Priest Deacon Yisrayl Abel expounded on the Law, which states: Do not follow the crowd in doing evil. The Peaceful Solution Character Education Program magnifies this teaching by explaining how to handle peer pressure. Citing examples such as Daniyl, David, Yahnathan, and Samuyl, we appreciate that these fine men never agreed with unrighteousness. The Deacon also spoke on the subject of respect and read excerpts from the Respect Unit. People who respect themselves are not pressured into doing something wrong. A friend will encourage you to do the right thing and will warn of consequences of doing the wrong. The Great Kohan Benyamin stood as third speaker; he rehearsed the seven-year peace plan as prophesied by the Great Prophet Daniyl. Reading Daniyl 9:24, the Kohan recapped Pastor’s writings on the “determined” 70 weeks and the all-important missing week. Noteworthy, is the fact that Yisrayl Hawkins foretold this event in his 1980s book, The Mark of the Beast. Dates, times, and events bring us to this year 2014. These are exciting days and Kohan Benyamin also presented details and the significance of the four colors of the straight-line rainbow as seen by our Great Teacher. Our fifth speaker was our Great Teacher, Yisrayl Hawkins. Today, Pastor spoke on the four colors, which will decorate the sashes that Yahweh’s People will display, at the Feast of Tabernacles. Four colors of the rainbow, as was seen in the sky, have significant meaning. Pink (light shade of red), green, yellow (gold), and purple were visible in a straight line over the sanctuary of The House of Yahweh. The colors denote our rough beginnings to who we are now. Yahweh’s people have grown in righteousness undergoing the refining process of converting to Yahweh’s Laws. From sinful, sickly people to the holy, healthy Family of Yahweh, the transition has been a long steady path. The linen sash is a sign – it is our badge of honor that we are practicing righteousness. Pastor asks the question: What makes us different? To answer, Yisrayl directs the congregation through a study of scriptures including I Corinthians, Hebrews, Colossians, Isayah, I Yahchanan, and Exodus. In Exodus 13:9, Pastor explains that we are the sign among the nations; we are the ones they will seek, to learn Yahweh’s Laws on how to gain health, peace, joy, and abundant living. We are created in the Image and Likeness of Yahweh and the Priests of Yahweh are His Teachers of Righteousness. 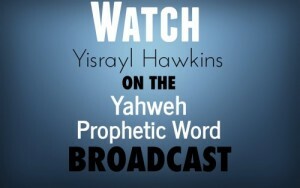 The people will soon seek knowledge from the mouth of the Priests of The House of Yahweh (Malakyah 2:7). There is no malice, wickedness, among Yahweh’s Priests (Teachers) and the nations will find only sincerity and truth. Today’s world is on the brink of World War 3 and the Pope has made the statement that the nations are now engaged in such a war. While claiming he does not condone war, he likewise says he approves of all necessary action to stop aggression. As the crusades devastated masses of peoples, hundreds of years ago, the objective to destroy any and all forms of holiness, continues in this modern day Vatican. In the battleground between western countries and emerging alliances between BRICS nations, Pastor states he and The House of Yahweh are not on either side. To the contrary, the only side we are on is Yahweh’s side, which is the side of peace that can only be achieved through the keeping of His Laws. Therefore, The House of Yahweh continues to reach out to the war-raging nations, daily, through modern technology, prophesied of by the Great Prophet Daniyl. We conclude the review with a verse from Isayah 44… They will spring up among the grass, as willows by the watercourses. The green in our rainbow shows our growth, eternal life – our reward.